Submitted Photo The Thunderbirds, the U.S. Air Force air demonstration team from Nellis Air Force Base, Nev., will headline Minot Air Force Base’s Northern Neighbors Day Air & Space Show on Saturday, Aug. 4. MINOT AIR FORCE BASE – It’s one of the biggest showings of military aircraft in North Dakota, along with its showing of a number of civilian aircraft and other activities. 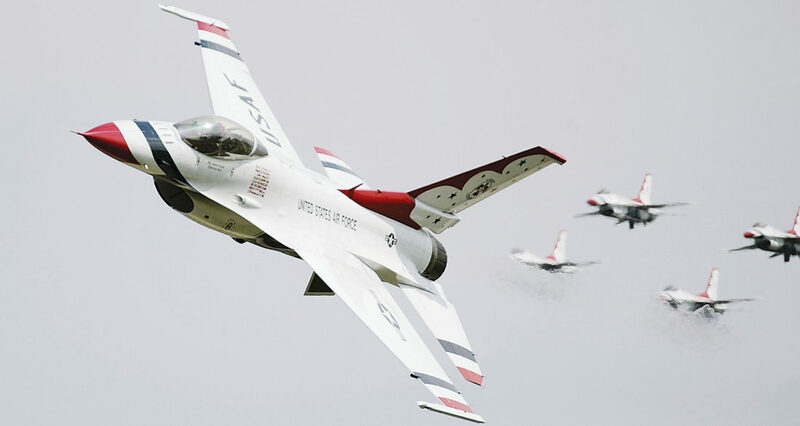 Northern Neighbors Day Air & Space Show, an open house and airshow, at Minot Air Force Base is set for Saturday, Aug. 4, with the world renowned U.S. Air Force Thunderbirds air demonstration team as the headliner. Gates open at 9 a.m., with the airshow starting at noon. Inbound traffic will stop at 3:30 p.m., and the airshow concludes about 5 p.m. The event is free to everyone. Traffic will be moved onto the base rapidly but people are asked to be sure to come early that day. Both the Magic City and South gates will be open (multiple lanes each) to visitors coming to the show. Maps on the Team Minot app and base website will be available to assist those unfamiliar with the base. 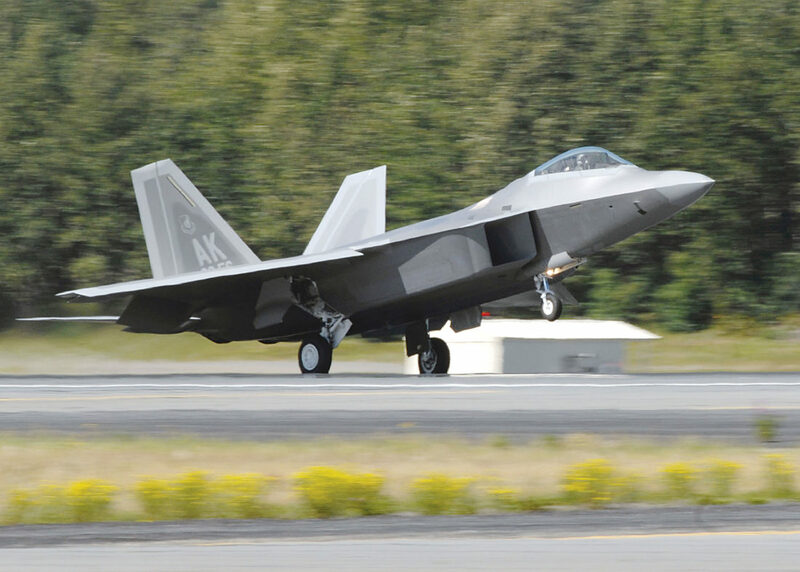 Submitted Photo An F-22 Raptor, shown in this Air Force photo, will be among static displays at Minot Air Force Base’s Northern Neighbors Day Air & Space Show Saturday, Aug. 4. Elmendorf became the second operational base and the first Pacific Air Forces installation to receive the aircraft in 2007. The F-22 performs both air-to-air and air-to-ground missions. “On behalf of the men and women of Minot Air Force Base, I want to extend a personal invitation to the Northern Neighbors Day Air & Space Show, held here at Minot AFB on Aug. 4, 2018,” said Col. Bradley L. Cochran, commander of the base’s 5th Bomb Wing. “This year, Team Minot has the distinct honor of hosting aerial demonstrations from the U.S. Air Force Thunderbirds, B-2 Spirit, B-25 Mitchell, the mighty B-52 Stratofortress and much, much more. There are events and displays guaranteed to impress all ages. “Additionally, you will have the chance to interact with many of our Team Minot Airmen. They embody the professionalism and excellence you, our community, have supported since we first arrived at Minot, 50 years ago. “Here at Minot AFB, we have a strong, proud history of providing global strike and nuclear deterrence capabilities for our nation. But, we would not be as successful without the unwavering support from our community. Northern Neighbors Day is just a small way to show our appreciation for all the support you have given us and to say thanks for working side-by-side with us and proving that we aren’t just next to a great community – we are part of one. “This will be an amazing event, and we hope to see you all here for the show,” said Cochran. Submitted Photo The RQ-4 Global Hawk, a high-altitude, long-endurance, remotely piloted aircraft, shown in this courtesy photo, will be flying in to Minot Air Force Base from Grand Forks AFB. It will be among the static displays at Minot Air Force Base’s Northern Neighbors Day Air & Space Show on Saturday, Aug. 4. 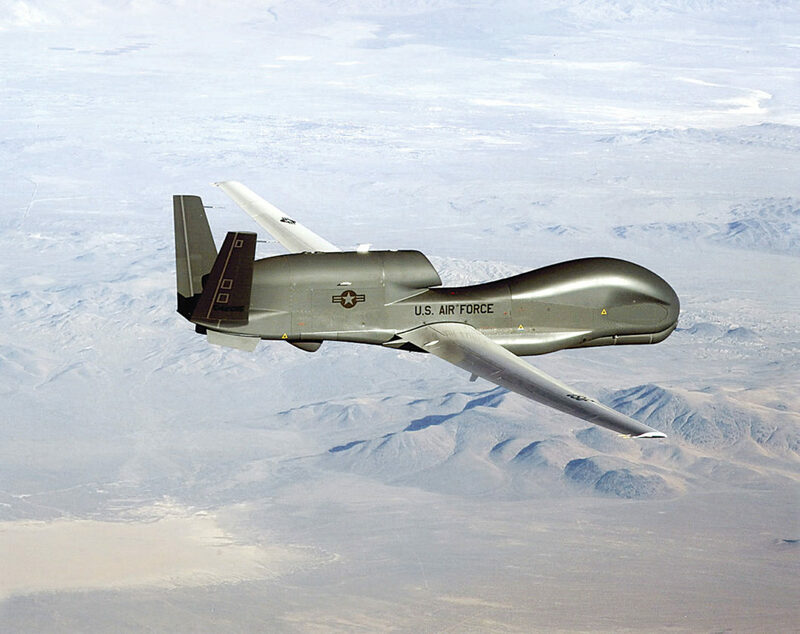 The first RQ-4 Global Hawk arrived at Grand Forks AFB in May 2011, marking the beginning of a new era of remotely piloted aircraft at the base. Maj. Richard Sandwick is Northern Neighbors Day director and Pat Travnicek and Jim Clifford, co-deputy directors. “The base is proud to open their gates to allow the public to see what we do not only at Minot Air Force Base but throughout the world,” said Travnicek. Nearly 20 static aircraft displays will be set up, the majority of them military aircraft, ranging from a World War II B-25 from the Commemorative Air Force Minnesota Wing to the F-22 Raptor from Elmendorf AFB, Alaska. The RQ-4 Global Hawk, a remotely piloted vehicle, will be flying in from Grand Forks AFB and also be among the static aircraft displays. Other static aircraft displays will be a Royal Canadian Air Force CF-Hornet from Cold Lake, Sask., a B-1B Lancer from Dyess AFB, Texas, a C-17 from McChord AFB, Wash., a UH-60 Blackhawk from the North Dakota National Guard in Bismarck and numerous others. A reunion of those assigned to the 91st/455th Missile Wing at Minot AFB is being held Aug. 2-4 in Minot. Chuck Emery, an organizer of the reunion, said 120 people are expected at the reunion including five people who were members of the 455th. The 455th was active from January 1962-June 1968, then became the 91st Strategic Missile Wing. Currently, it is the 91st Missile Wing. The group plans to visit missile facilities on base on Friday and attend Northern Neighbors Day on Saturday. Two retired Air Force lieutenant colonels, Brad Foote of Annapolis, Md., and Bill Sims of Yuba City, Calif., and their wives will also be attending Northern Neighbors Day. Foote and Sims were aircrew members of one of the first new B-52H bombers to arrive at the base in 1961. Jill Schramm/MDN Fern Laudenschlager, superintendent of the Food and Needlework divisions at the North Dakota State Fairs, stands next to quilt exhibits in the State Fair Center. Photos by Andrea Johnson and Michael Sasser/MDN Fair visitors congregate the grounds at the North Dakota State Fair. The fair wrapped up with a concert by Nickleback and Pop Evil Saturday night. Submitted Photo Pacific Coast by Jake Nixon is an example of work that will be on display at the Taube Museum. Those with handicap parking placards should display them in their vehicles as they enter the base on Northern Neighbors Day so they can be directed to the proper parking locations. Airshow ends about 5 p.m.
ATMs will be available to visitors at Northern Neighbors Day. Food and beverages will be available at concessions.